Inspired by The Great British Bake Off? Why not make Lorraine Pascale's showstopping Devil's Food Cupcake Cones. The Great British Bake Off returns to our screens (albeit in a controversial new home) at 8pm on 29th August on Channel Four. If you're feeling inspired by the culinary skills of the new contestants why not make Lorraine Pascale's Devil's Food Cupcake Cones, taken from her new book, Bake. Devil's food cake is a very rich dark chocolate cake, made with cocoa powder and melted dark chocolate. It makes a delicious surprise filling for these ice-cream themed cupcakes. I recommend piping the cake mixture into the ice-cream cones because it's quick and ensures you get the mixture right to the bottom. Decorate with your favourite ice-cream toppings - I've use sprinkles, but you may prefer finely chopped nuts. Preheat the oven to 180°C (fan 160°C/350°F/gas 4) and sit the ice-cream cones in the holes of the cupcake tin to hold them upright. Melt the butter in a small pan over a low heat, and then take the pan off the heat and add the dark chocolate. Leave the chocolate to melt. then pipe into the ice-cream cones, filling them no more than three-quarters full or they will overflow while they are cooking. Place the tin into the oven and bake for 20–25 minutes, or until they are baked. 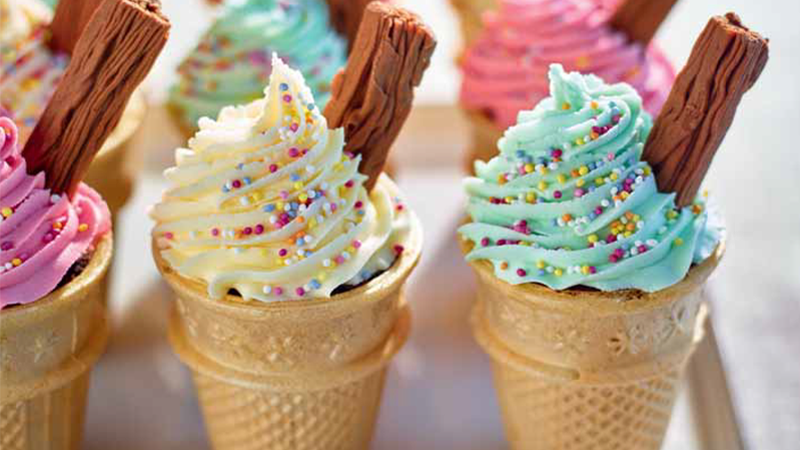 To check that they are cooked, insert a skewer into the centre of a cupcake cone – it should come out clean. Once the cupcake cones are baked, remove them from the oven and leave to cool completely. While the cones are cooling, make the frosting. Put all of the ingredients apart from the colouring into a large bowl and beat well with the hand-held electric whisk or until the mixture goes light and fluffy. You can also use a stand mixer fitted with a paddle attachment to do this. To colour the frosting, divide it into bowls and stir through each food colouring, as desired. Take a piping bag fitted with the 1cm straight nozzle and half-fill it with the frosting. If you have coloured your frosting, use a different bag for each colour. Pipe the frosting onto the cupcakes so that it looks like ice cream, as per the photograph opposite. Add sprinkles to each one, and if you feel like it, stick half a chocolate flake in the top to make it look like our beloved Mr Whippy! Serve. Inspired by The Great British Bake Off but don't know where to start? With 125 simple recipes, all with simple step-by-step instructions, Lorraine Pascale's Bake will help you whisk, knead, dust and drizzle your way to sweet success.